This is part of a SEEB series entitled “Russian Studies in the Era of Trump” organized by Ani Kokobobo. The recent Helsinki summit between Donald Trump and Vladimir Putin, together with the ongoing Mueller investigation on Russian interference in the 2016 US elections, have certainly kept Russia in the media and public discourse throughout this summer. If the adage “There’s no such thing as bad publicity” were true, we should all expect double or even triple enrollments in Russian courses this fall! A more realistic and pragmatic view, however, might suggest a different tact in preparing our programs and our learners for what appears to be a never-ending flow of attention—much of it negative—on Russia and US/Russia relations in the media and in our personal spaces. In these times of heightened negative rhetoric and a lowered level of civility in public discourse, especially in emotionally-charged topics such as immigration, individual rights, election outcomes, and yes, Russia itself, the language and culture classroom can provide an ideal environment to develop not only language skills, but to acquire first-language discourse and communication skills to navigate the fraught waters of today’s negative post-factual conversations. 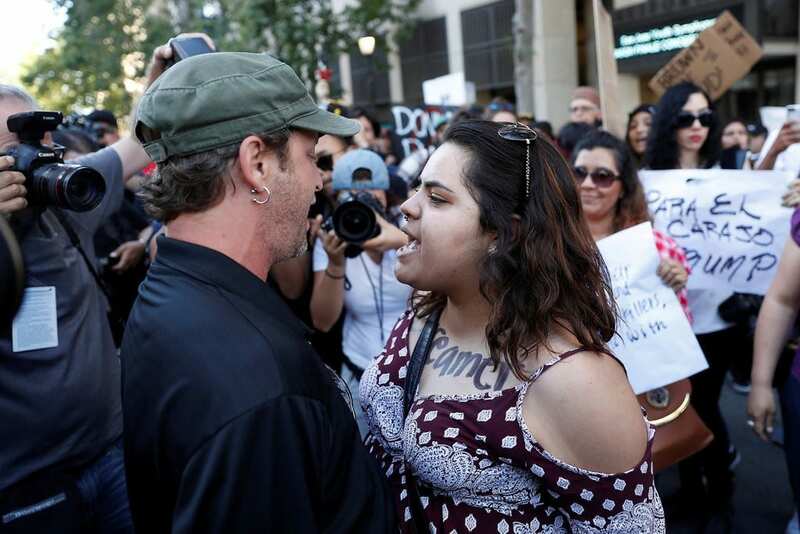 exchange words outside a Trump rally in San Jose, Calif. Preparing 21st-century learners with the skills to use Russian in a variety of social and rhetorical settings in which they can communicate meaning effectively requires a self study of existing language programs. The first step in reexamining our language and culture classrooms and curricula is to determine to what extent critical pedagogy1—which can be defined as socially conscious pedagogy—is used in existing courses at all proficiency levels. Critical pedagogy in world language education attempts to “make language study both relevant for students and more critical with respect to its value in the development of the educated person in a democratic society” (Reagan and Osborn xii). Critical pedagogy can be incorporated into our classes, where it can simultaneously help prepare learners not only linguistically, but also rhetorically and affectively, for the kinds of challenging and difficult global discourse they are facing. Such a shift requires embracing both proficiency-based and task-based instruction2 from the first through the last days of instruction, providing learners with many and varied sources of authentic, current materials that can yield the base for modeling and practicing increasingly complex discourse, and constructing meaningful opportunities for learners to engage in robust, but civil, exchange of ideas. As articulated by Regan and Osborn, “We advocate in this regard that language classrooms themselves become sites of challenging hegemonic ideologies, of liberating students from oppressive cognitive, intellectual, and sociological constructs that have thus far been created or reinforced in our context” (90). At the Novice level of instruction, such instruction might begin by providing learners with multiple perspectives, definitions, and responses to every prompt, eschewing notions—including grammatical!—that there is only one “right” answer every time. Instead learners begin the process of acquiring Russian by reading not simply each word, but also reading the world to which it refers. Seemingly routine classroom questions, often unasked, might involve learner-centered decisions regarding gender use (given the gender-marked environment of Russian) in self-identification, or familial relations that may not be mother-father-sibling. By beginning with a base that is more dialogic and less strictly binary, learners can advance much more easily more to the Intermediate level where they are faced with tasks that require them to state their opinions. They will also, it is hoped, begin to develop the skills—skills that transfer readily to the native language—to allow them to communicate with self-conviction as well as with generosity toward their interlocutors, demonstrating the hallmarks of civil discourse. Essential from the first days of instruction and onward is the use of authentic materials of varied media, including online. In addition to providing current, relevant input in multiple modalities, media-based materials are particularly appropriate within a critical pedagogy of global languages. Visual, auditory, and textual media require the learner to engage critically with constructed messages in order to understand them through “selective perception and negotiating meaning” (Osborn, 92). This procedure, mediated and practiced in the classroom and/or online, helps learners develop the necessary skills, through the steps of interpreting and negotiation of meaning, to move toward communicating critically on the content in a class presentation format. At the Advanced to Superior levels of proficiency, as learners are challenged not only to defend their points of view and perspectives with evidence, but also to hypothesize about the outcomes and effects of their propositions, a number of the topics of debate on CNN and Fox News can prove excellent fodder for linguacultural development in class. The structure and execution of such debate-based courses are well-documented by Brown and Bown3 (2004) and have served as a model for similar courses nationwide. What is crucial about these courses is that they fully embrace a more formal debate-style discourse format, in line with national and international debate societies’ standards, such as The University Interscholastic League (UIL) or the National Forensic League (NFL) in the States, or the World Universities Debating Council (WUDC). Organizations such as these have established sets of rules, formats, and procedures for formal debate that can be easily adopted in a language course setting. The rules and procedures not only give structure and purpose to the debate format, but also establish a common “code of conduct” during the debate sessions. Students may not, for example, resort to hurling invectives or engaging in ad hominem attacks on their opponents. Argumentation must be, and is so judged, concisely and clearly expressed, well-documented, and effectively presented within the established rubrics of formal debate. Central to the debate format is the development not only of linguistic skills in the language, but also of cognitive, discourse, argumentation, and presentational skills. As Brown and Bown state, “In addition to educating students about significant social and political issues, debate fosters critical thinking and analytical skills as well as respect for opposing opinions and an increased capacity to relate to others” (1). In conjunction with a critical pedagogy, the kinds of topics and situations that arise as the subject for global debate in the classroom provide precisely the kind of context that engenders examination and discussion through a variety of critical lenses and perspectives. Learners are not, therefore, trapped in the confines of a single narrative or perspective in the analysis, say, of a single common literary or political text, but rather are asked to engage with the material in a way that is much more individuated and personal for each learner and his/her/their identity. We are fortunate in our profession as instructors of language and culture to have several sets of standards and guidelines to inform and help shape our curricular content and methods in critical pedagogy. Of particular note in this regard are the ACTFL World-Readiness Standards for Russian (2017). Focusing on the inherent interdisciplinarity and multimodality of language and its acquisition, the Standards are well-suited to help frame a critical pedagogy of global languages. As Reagan and Osborn conclude, “Although collaborations with other disciplinary specialists within the academic setting may seem restricted because the fluency required to discuss complex topics in the second language often eludes students, in reality the newest standards and mandates provide multiple opportunities for connections and comparisons in the second language classroom” (80). 1 “Critical pedagogy” here refers to the application of the underpinnings of socially-conscious pedagogies proposed by educators including Paolo Friere and Ira Shor, among others, in the teaching of global languages and cultures. It is informed by the work of the ACTFL World-Readiness Standards and the Proficiency Guidelines, among other standards for professional competence in world languages. See Reagan, Timothy G. and Osborn, Terry A. (2002). The Foreign Language Educator in Society: Toward a Critical Pedagogy. Mahwah, NJ: Lawrence Erlbaum Associates, Publishers; and Osborn, Terry A. (2006). Teaching World Languages for Social Justice: A Sourcebook of Principle and Practices. Mahwah, NJ: Lawrence Erlbaum Associates, Publishers. 2 Task-Based Instruction (TBI) is outlined and discussed in detail in Leaver and Willis, eds. (2004). Task-Based Instruction in Foreign Language Education: Practices and Programs, Washington, DC: Georgetown University Press. 3 Brown, Tony and Bown, Jennifer. (2004) Teaching Advanced Language Skills through Global Debate: Theory and Practice. Washington, DC: Georgetown University Press; see also Brown, Tony, Balykhina, Tatiana, Talalakina, Ekaterina, Bown, Jennifer, and Kurilenko, Viktoria. (2014). Mastering Russian through Global Debate. Washington, DC: Georgetown University Press. Thomas Jesús Garza is University Distinguished Teaching Associate Professor in the Department of Slavic and Eurasian Studies and the Director of the Liberal Arts Texas Language Center. SEEB is currently accepting blog post ideas and submissions from graduate students and faculty members. Please visit this page to learn more about our submission guidelines. We look forward to working with you! Posted by Sean Ray at 11:33am 09/27/2018 Posted in Trump. Bookmark the permalink. The site is maintained by Sean Ray at the Department of Slavic and East European Languages and Culture at Ohio State University. If you would like to submit an article, please navigate to the "SEEJ Information" drop down menu and click "Submit Manuscript."